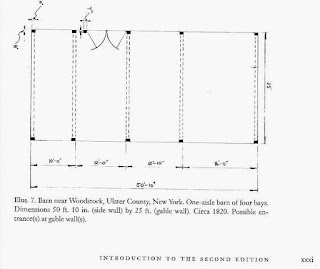 This is the second part of my look at the geometry of the layouts of New York and New Jersey barns built at a time of intermingling of old world building traditions - post 1800. The New World Dutch Barn. As before I redrew the plan based on the given dimensions. 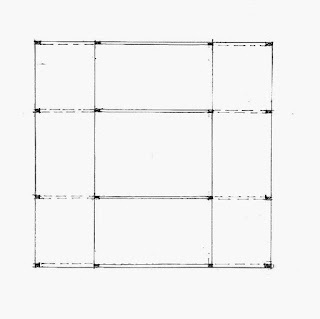 I found again that the framer began his layout after he had decided the size: here about 25 ft x 50 ft. Beginning from the left side, with the corner posts already in mind, he laid out 2 squares. geometry does not quite work. 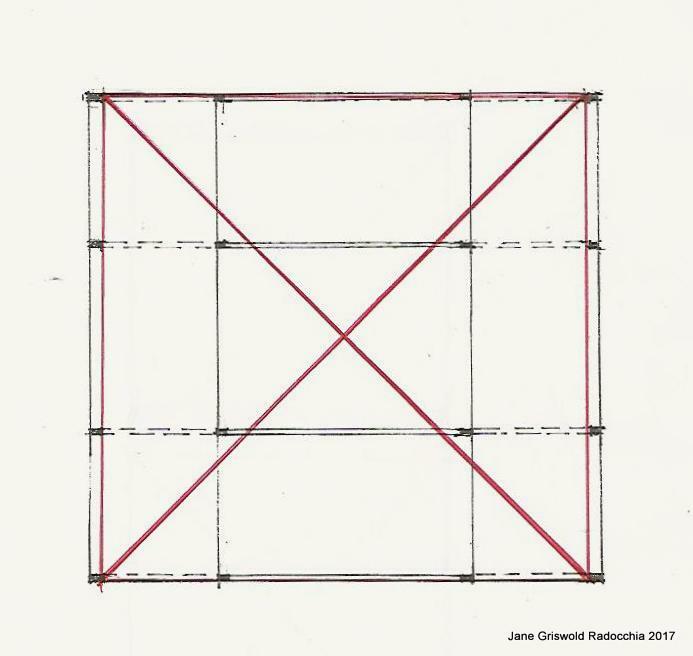 The center of each square is just about the same distance to the right of a beam. 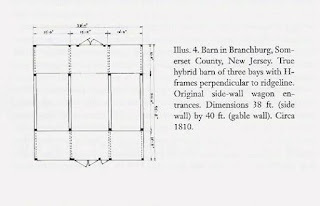 If the framer laid out the squares using the rule explained by Asher Benjamin, Owen Biddle, and Peter Nicholson * he would have swung an arc the width of his proposed barn from the corner of his plan. When he swung an arc from the other corner the 2 arcs crossed. And there - where I have added a circle - he located his beam. 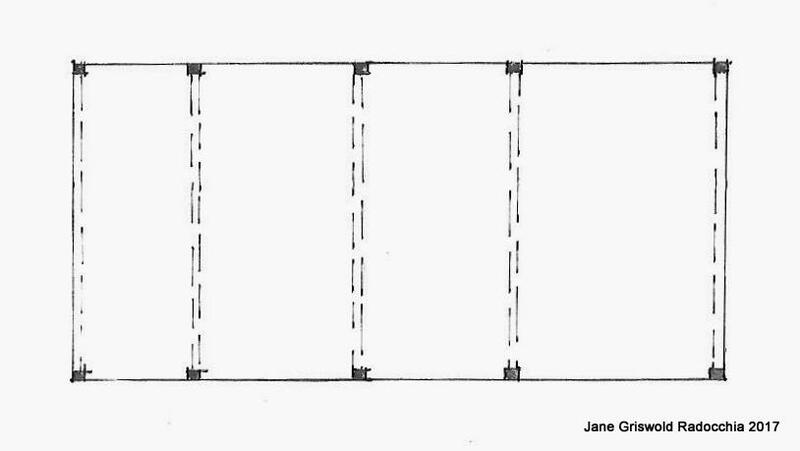 He would have used a cord to mark the distance on each long wall for the location of the posts. 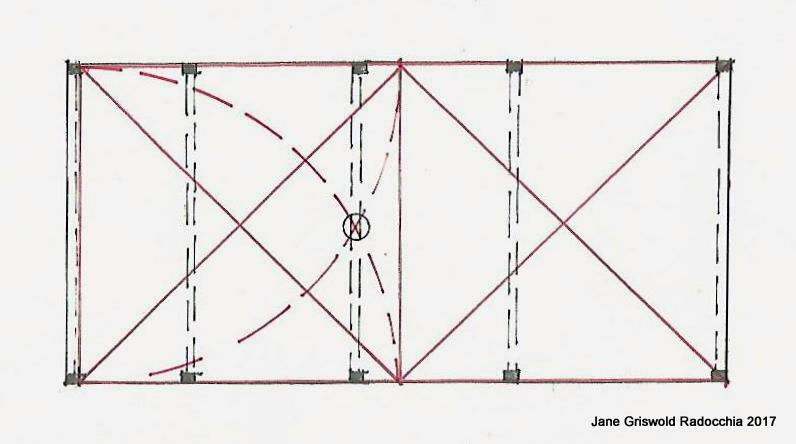 That beam is the center for a circle that determines the locations of the other 2 beams - marked by 2 more circles. 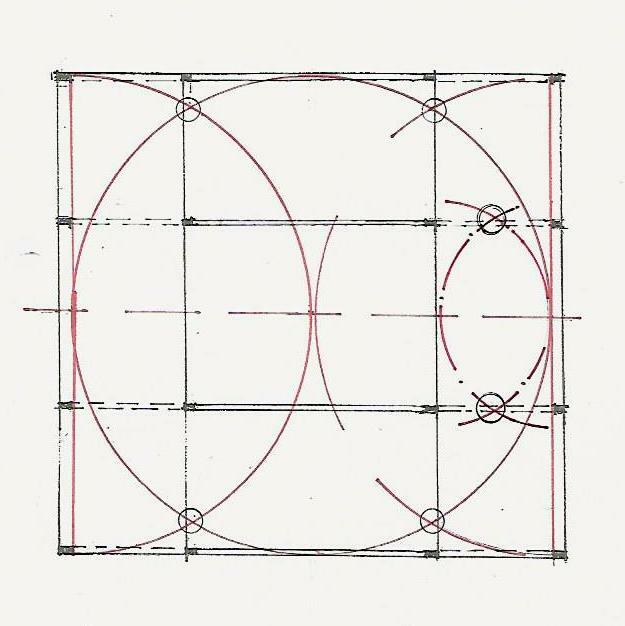 That first circle is also the center of a square. 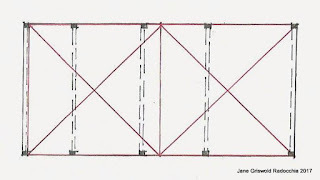 The framer could have laid out a square, or simply taken half the length of his end wall (already measured by the layout of the squares) and laid that out on either side of his middle posts and beam. Here are Huber's drawing and notes for Illus. 4, p. xxviii. and my redrawing, using his dimensions. I turned it so that the side where the framer began his layout is to the left. 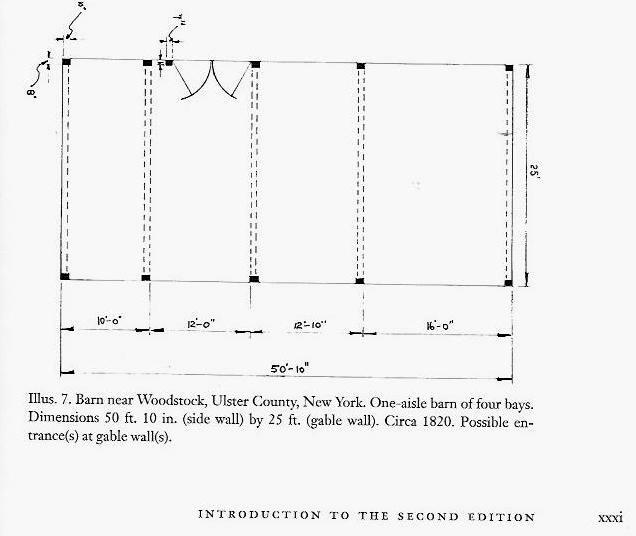 Knowing what he wanted to build he could use the barn location as his framing floor. I think he laid out a square, 38 ft on each side and placed his corner posts outside the lines. 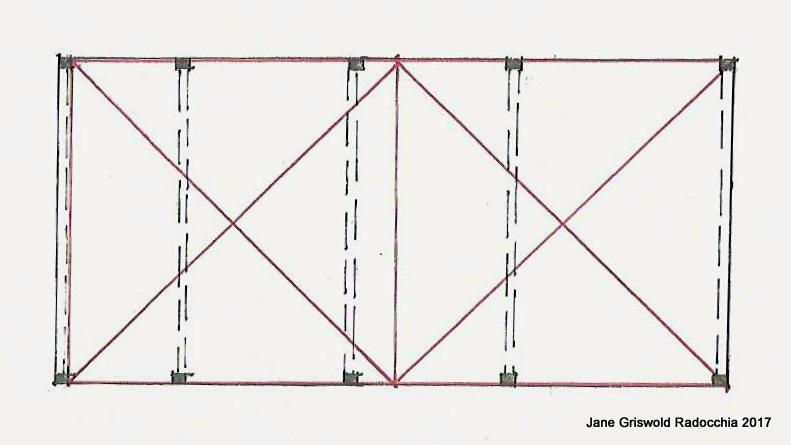 He had several choices for placing his intermediate posts and beams using geometry. Here is one: He located the center of the wall. 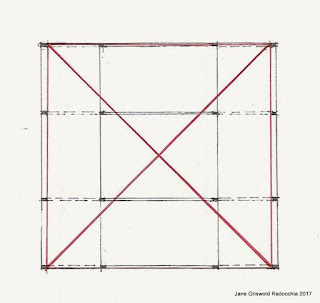 Using half the length of the square's side he drew an arc on each end. Using the center of his square he drew a circle. 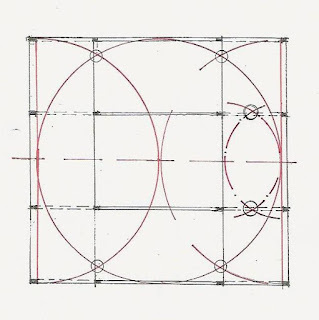 Where the arcs intersected he drew a line and located his posts on the exterior walls. 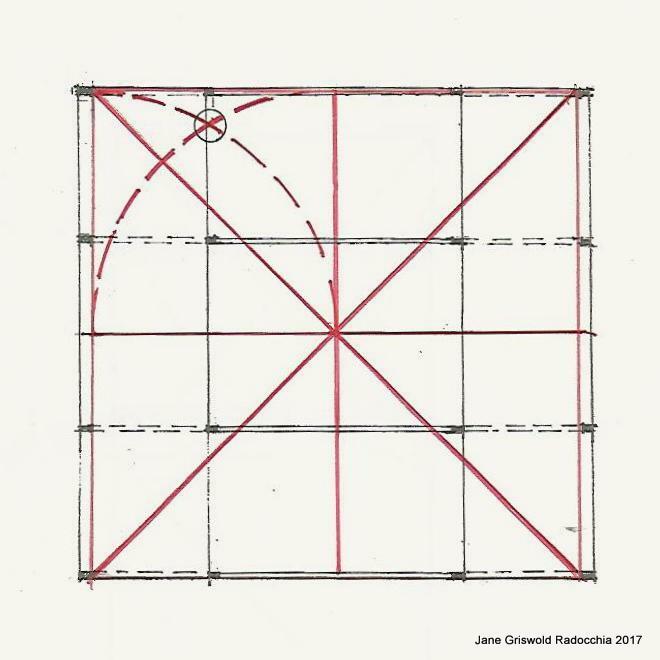 Using the distance from the exterior square of the barn to the intermediate posts as his radius he drew 2 more half circles. 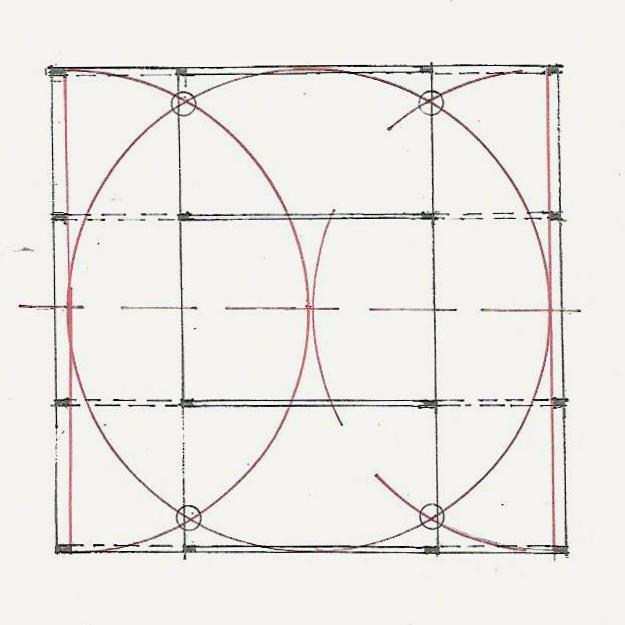 where the radii cross he laid put his bays and set the interior posts at the intersections. 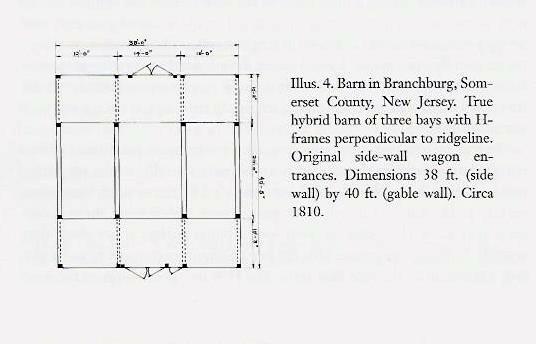 The framer could have laid out the barn with 4 squares. 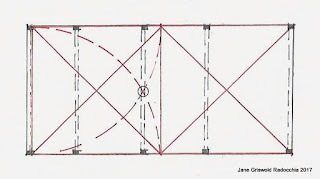 As each was laid out the arcs would have crossed, just as they did in the barn shown in Illus. 7. 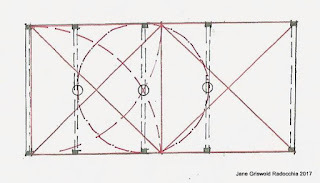 He could also have used the circle to find the length and width of his barn. Both of these systems seem to be more complicated than the order I described. 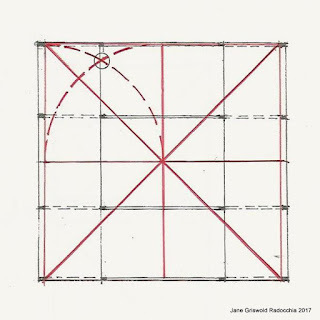 These diagrams may become teaching tools when I give a workshop at the International Preservation Trades Network Workshops in Detroit this September. These ways of designing were carried with those who settled the Midwest. 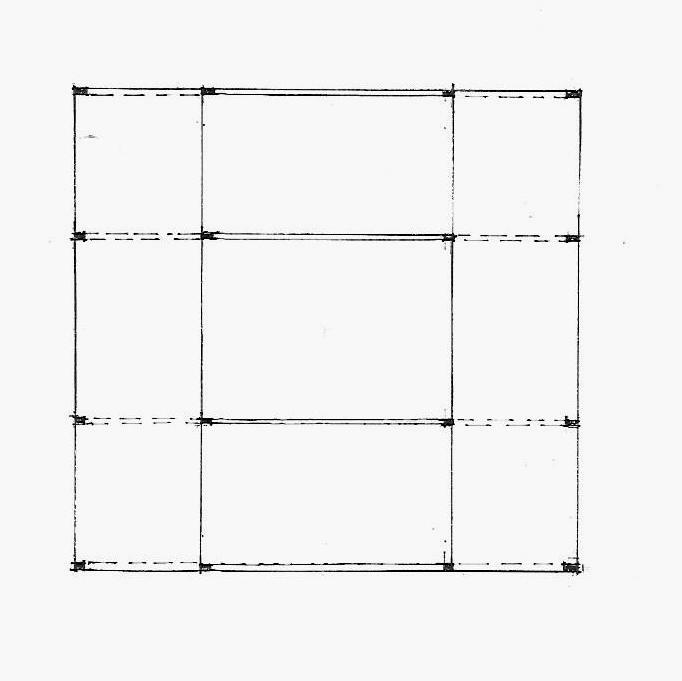 2 squares side by side (as used in Illus. 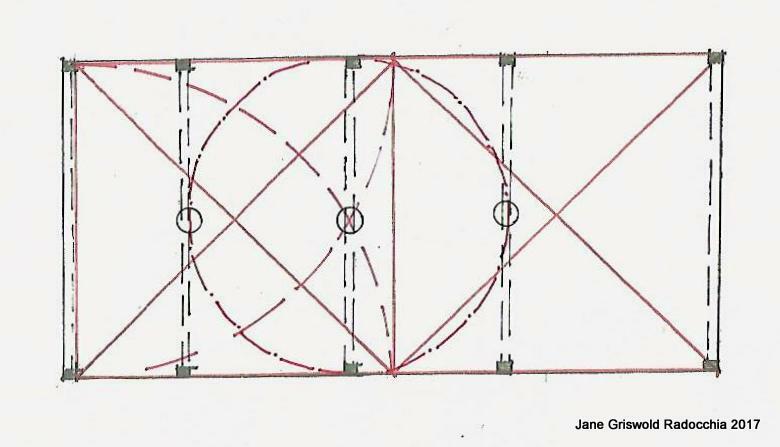 7 above) is the beginning plan for the I House, so named because the shape is so common in Indiana, Illinois and Iowa. How did these hybrid barns looked? How were they used? 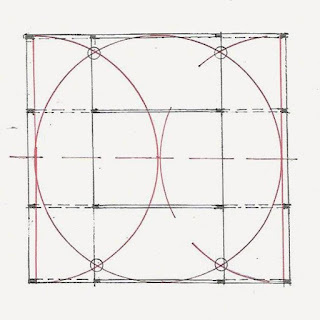 Unable to connect the geometry of the plan to that of the intent, the structure, the bents, and dimensions, I might have missed critical information.